AGE SPECIALIST 35+ COLLAGEN BIOSPHERES by L'OREAL Paris is very nice new product of the beauty market worldwide. 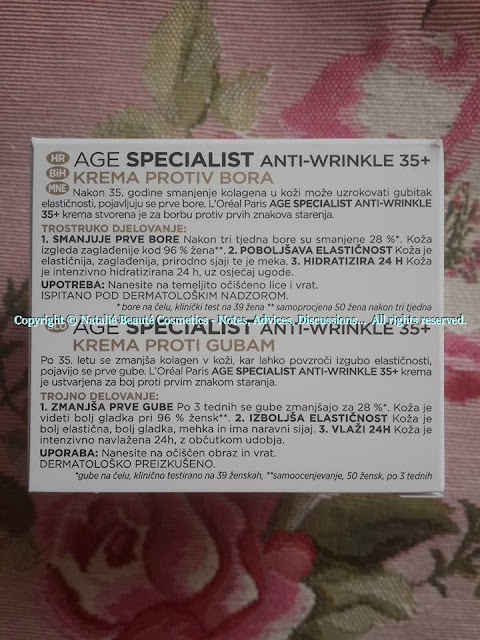 You can see this product is different variants (as Wrinkle Expert 35+ Collagen, Anti-Falten Experten 35+, Age-Expertise Soin de Jour 35+, AGE SPECIALIST 35+ COLLAGEN BIOSPHERES (Day), etc. ), but in European and Russian market it's spreaded as it's written above. That's why, I can provide you here only one proper website link, responding to the product, which I have and I'm reviewing here. "A partir de 35 ans la concentration de collagène dans la peau diminue. La peau perd de son rebond, rides et ridules commencent à apparaître. Le soin hydratant Age Expertise 35+ est enrichi en biosphère de collagène qui s'infiltrent dans l'épiderme et augmentent jusqu'à 3 fois leur volume initial. Les 1ères rides sont réduites, la peau gagne en élasticité et elle est hydratée pendant 24 heures." 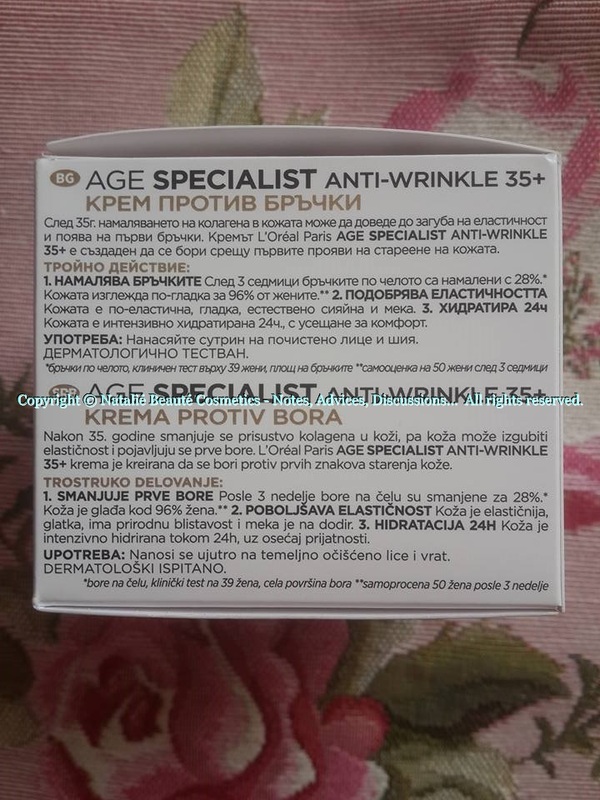 "From 35 years the concentration of collagen in the skin decreases. The skin loses its rebound, wrinkles and fine lines begin to appear. The Age Expertise 35+ moisturizing care is enriched in collagen biospheres that infiltrate the epidermis and increase up to 3 times their initial volume. The 1st wrinkles are reduced, the skin gains in elasticity and it is hydrated for 24 hours." If you think, that you can find miracle cream, which really will boost the collagen in your skin, this is not gonna happen. 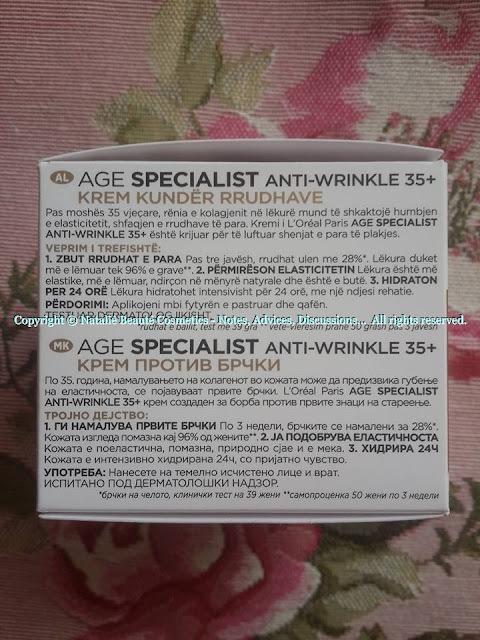 Is this cream working anyway? Yes, it moisturises the skin, it makes it elastic, it nourishes it, it gives feelings of comfort and calmness. I've also noticed, that this cream is working very well in combination with another skin product - serum. I'm using this cream after PROLIXIR and GARDERICA products, and I can say, that all together are working very well. It's suitable also for younger age. It all depends of what needs your skin has at the moment. The structure of the cream looks thicker, but when you swipe it with your finger, you feel it like melting butter. The skin absorbs it immediately, without any oily or sticky sensation left. It's comfortable for Summer, too. 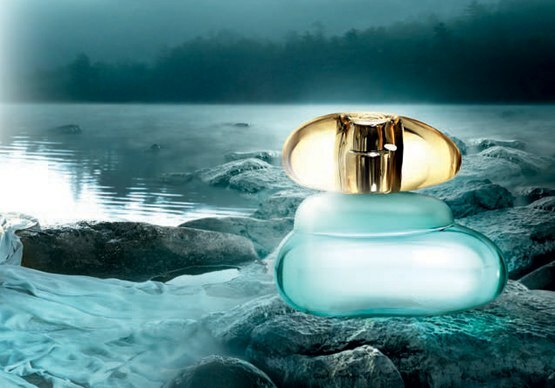 It's very skin friendly and delicate product. Perfect for base, under your makeup. 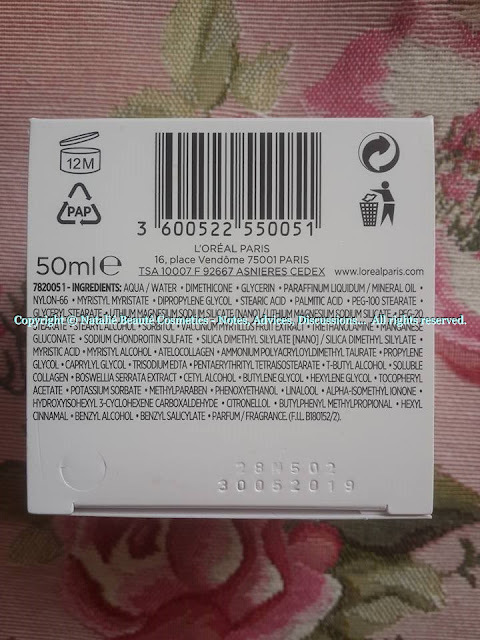 782005 1 - INGREDIENTS: AQUA / WATER • DIMETHICONE • GLYCERIN • PARAFFINUM LIQUIDUM / MINERAL OIL • NYLON-66 • MYRISTYL MYRISTATE • DIPROPYLENE GLYCOL • STEARIC ACID • PALMITIC ACID • PEG-100 STEARATE • GLYCERYL STEARATE • LITHIUM MAGNESIUM SODIUM SILICATE [NANO] / LITHIUM MAGNESIUM • SODIUM SILICATE • PEG-20 STEARATE • STEARYL ALCOHOL • SORBITOL • VACCINIUM MYRTILLUS FRUIT EXTRACT • TRIETHANOLAMINE • MANGANESE GLUCONATE • SODIUM CHONDROITIN SULFATE • SILICA DIMETHYL SILYLATE [NANO] / SILICA DIMETHYL SILYLATE • MYRISTIC ACID • MYRISTYL ALCOHOL • ATELOCOLLAGEN • AMMONIUM POLYACRYLDIMETHYLTAURAMIDE / AMMONIUM • POLYACRYLOYLDIMETHYL TAURATE • PROPYLENE GLYCOL • CAPRYLYL GLYCOL • TRISODIUM EDTA • PENTAERYTHRITYL TETRAISOSTEARATE • T-BUTYL ALCOHOL • SOLUBLE COLLAGEN • BOSWELLIA SERRATA EXTRACT / BOSWELLIA SERRATA EXTRACT • CETYL ALCOHOL • BUTYLENE GLYCOL • HEXYLENE GLYCOL • TOCOPHERYL ACETATE • POTASSIUM SORBATE • METHYLPARABEN • PHENOXYETHANOL • LINALOOL • ALPHA-ISOMETHYL IONONE • HYDROXYISOHEXYL 3-CYCLOHEXENE CARBOXALDEHYDE • CITRONELLOL • BUTYLPHENYL METHYLPROPIONAL • HEXYL CINNAMAL • BENZYL ALCOHOL • BENZYL SALICYLATE • PARFUM / FRAGRANCE • (F.I.L. B180152/1). The jar is made by non-transparent white glass, (which is wonderful detail - I admire this decision of L'OREAL Paris), 50 ml. 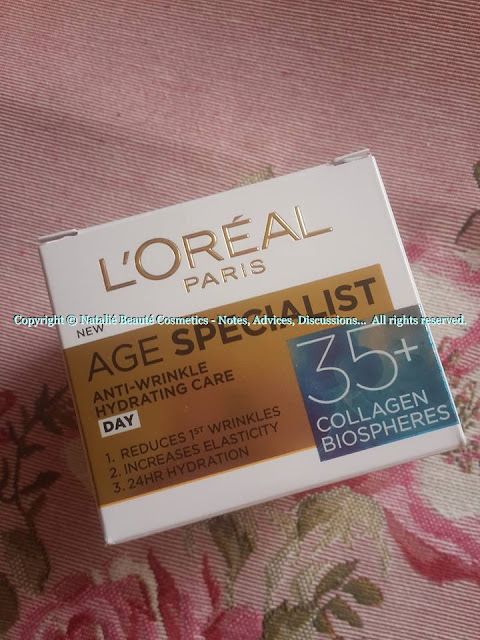 AGE SPECIALIST 35+ COLLAGEN BIOSPHERES by L'OREAL Paris is wonderful product, which might meet your skin needs and can become very good part from you daily skincare routine. Maybe, you can give it a try.